After a wonderful stay in Vietnam, it was time to continue my trip. This time, I would be flying Singapore Airlines from Ho Chi Minh City to Singapore. 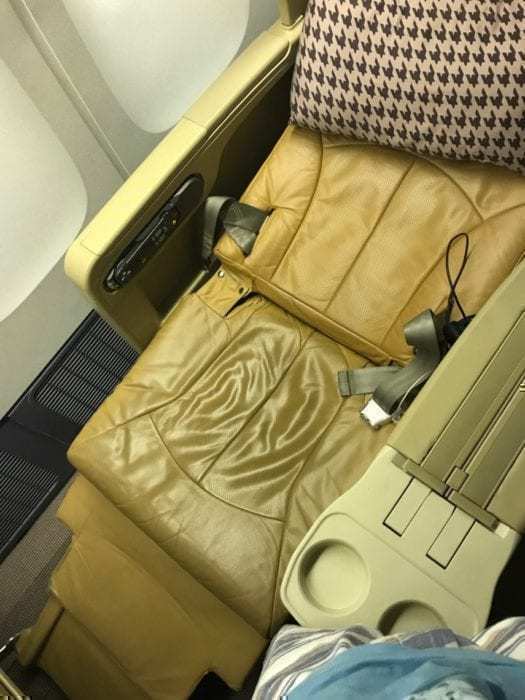 This was my first time flying Singapore Airlines and I was really excited. Low-cost carriers like VietJet, Scoot, and Jetstar routinely offer one-way economy flights for under $50USD. Round trip flights cost slightly more. On the other hand, business class does not come cheap. On Singapore Airlines, this one-way ticket will cost a minimum of $425. 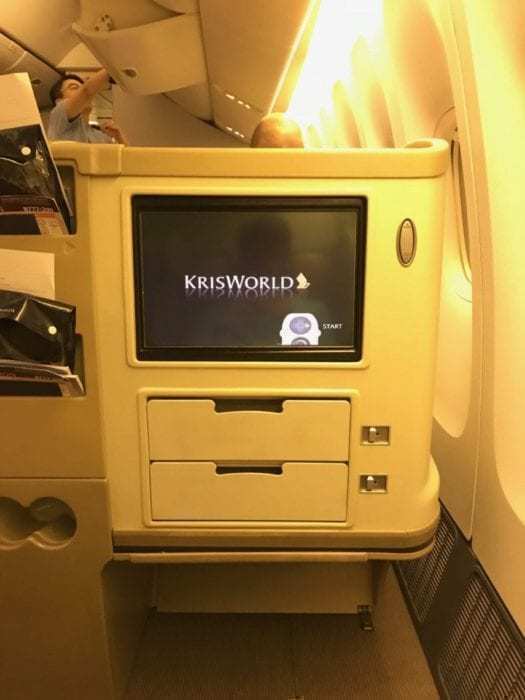 Singapore Airlines award availability is not always easy to find outside of their own KrisFlyer program. I paid cash for this ticket. I arrived at Tan Son Nhat International Airport about three hours prior to departure. Within thirty minutes, I had checked my bags, cleared immigration, and passed through security. 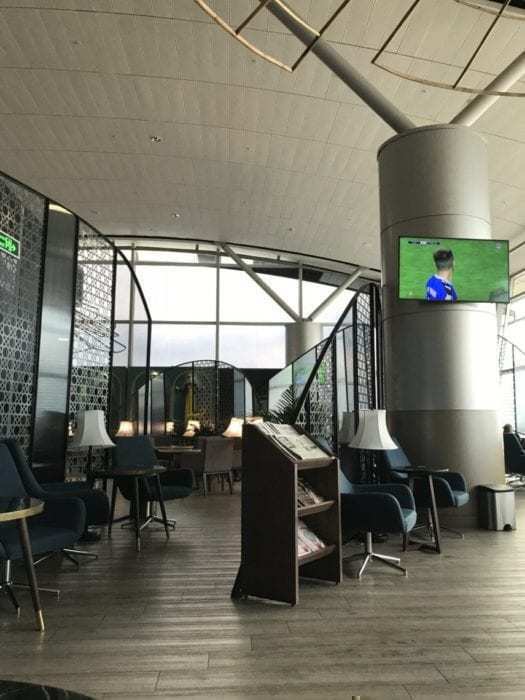 Despite the relatively significant number of flights departing at this time, including Qatar’s A350 flight to Doha, it was surprising to me that only two security lanes were open. However, they were efficient in handling a large number of passengers. 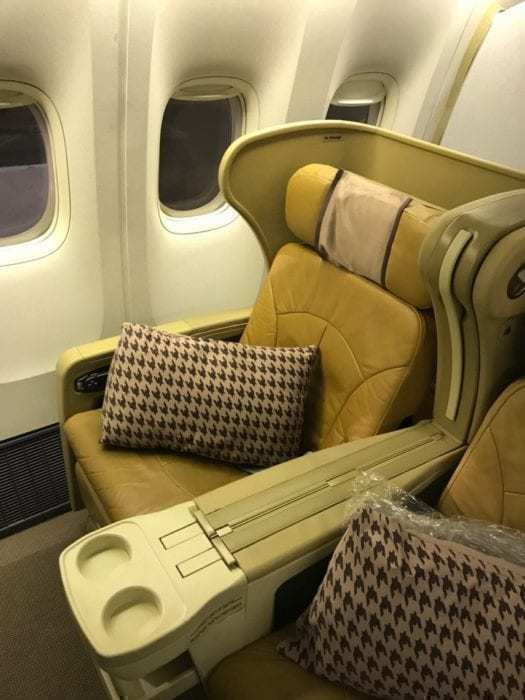 Singapore Airlines offered business class passengers one of four options for ground amenities: lounge access, restaurant/cafe/bar credit, spa treatment, or Illy coffee. 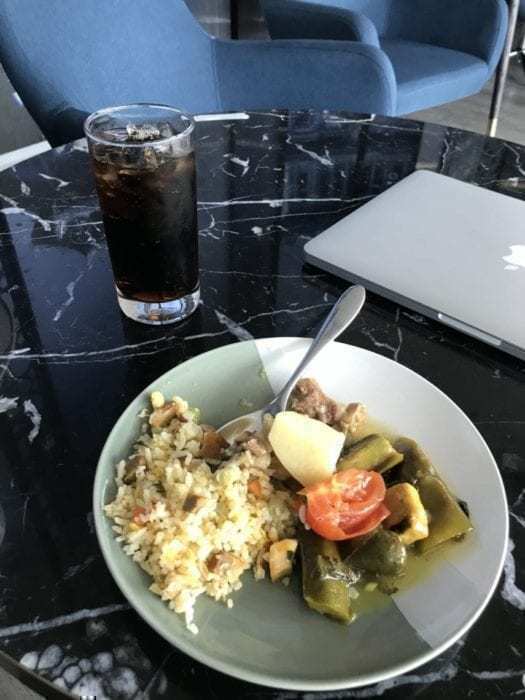 I chose lounge access at the SASCO Le Saigonnais Lounge. The lounge featured plenty of seating and food options. When I arrived, the lounge felt open and airy. There were plenty of fresh food and drink options. However, the lounge quickly filled up as more passengers arrived. 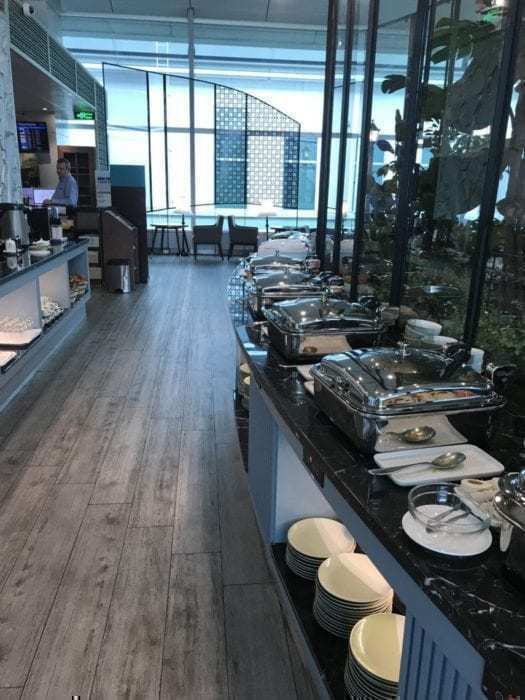 It seems like Qatar Airways, Thai, and Cathay Pacific business class passengers receive access to this lounge as well. There were a few different seating areas ranging from tables by the window, bar tables, and lounge chairs. I appreciated how most seating areas were near power outlets. There were multiple food options catering to Japanese, Halal, Chinese, and Vietnamese cuisine. SASCO Le Saigonnais Lounge food. I opted to try some Vietnamese dishes. First, I went with some braised eggplant, beef curry, and steamed rice with meat bits. For a drink, I chose to go with a simple Pepsi. Thanks to the fast wifi, I was able to stream Netflix which helped pass the time. I made my way to the gate shortly before 7:00pm. Boarding started at 7:05pm for our 7:40pm departure. I boarded through the forward door. Upon entry, I turned right into the forward business class cabin. A smiling flight attendant escorted me to my seat. Firstly, I had selected this late-night departure so I could fly on Singapore Airlines’ 787-10. However, due to some engine issues, my flight was swapped out for one of their regional configuration 777-200ERs. Given the transition from a brand new, 1-2-1 lie-flat seat to a 2-2-2 angle flat seat, I downgraded some of my expectations from the seat. From the first look, I could tell these seats were very worn. 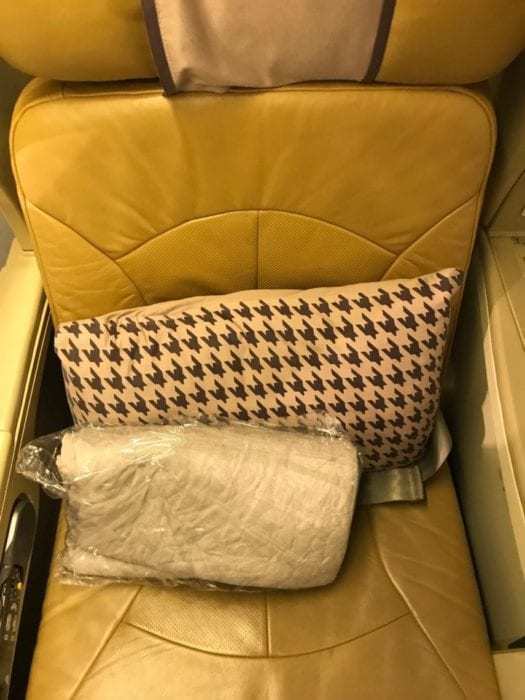 It’s worth noting that this seat is very similar to Fiji Airways’ product, except Singapore Airlines’ seat is far more angled. For a short, two-hour hop, this was an excellent product. However, on a long-haul flight, I definitely wouldn’t like to see this product onboard. Thankfully, I haven’t seen this kind of configuration operating long-haul flights with Singapore Airlines. Waiting at each seat was a pillow and blanket. The blanket would have been fantastic for a long-haul flight, let alone this short hop. I also found the pillow to be very well padded and comfortable. Singapore Airlines did a fantastic job with their bedding. Waiting at my seat were an excellent pillow and blanket. There were no other amenities offered in a kit. I wasn’t disappointed and didn’t expect it. 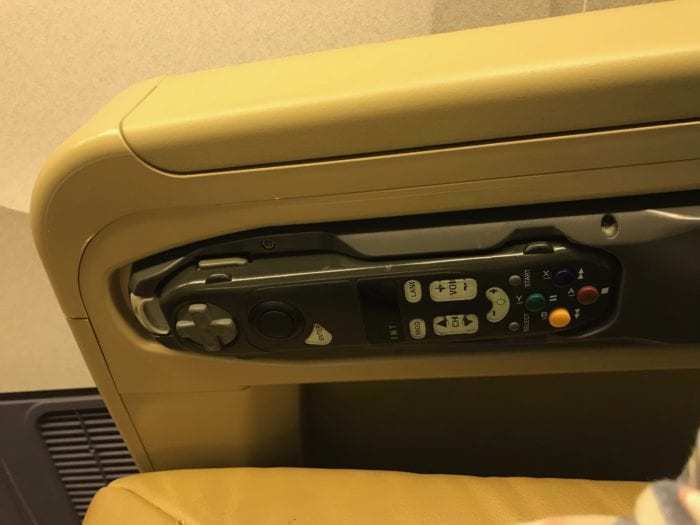 On the right-hand armrest was the remote control. This was one old remote control. On the back side was a satellite phone. 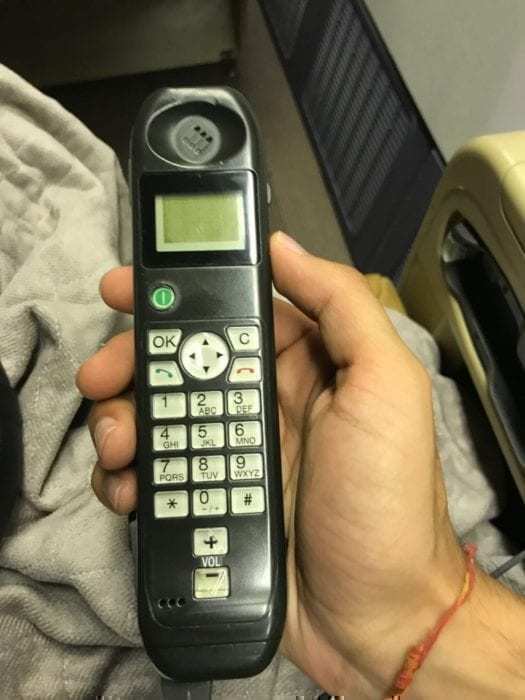 I haven’t seen a satellite phone on a plane in at least ten years. I was tempted to try it, however, it didn’t seem to be activated. 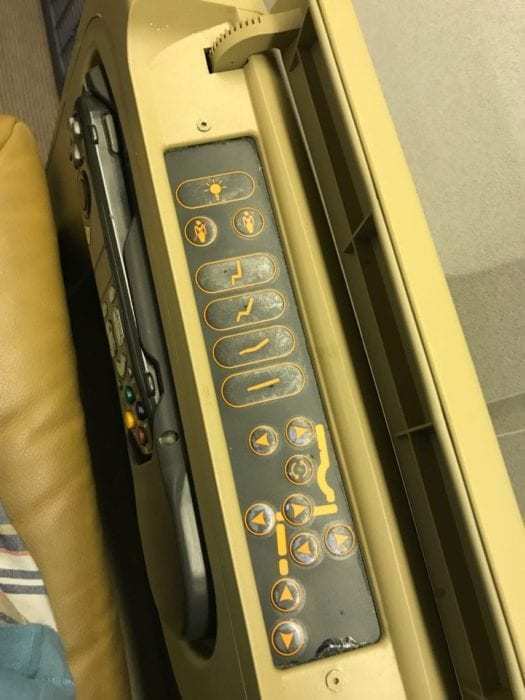 Just above the remote control, in a little panel, were the seat controls and flight attendant call buttons. These were simple and intuitive. Despite what the seat controls look like, this absolutely was not anywhere close to lie-flat. 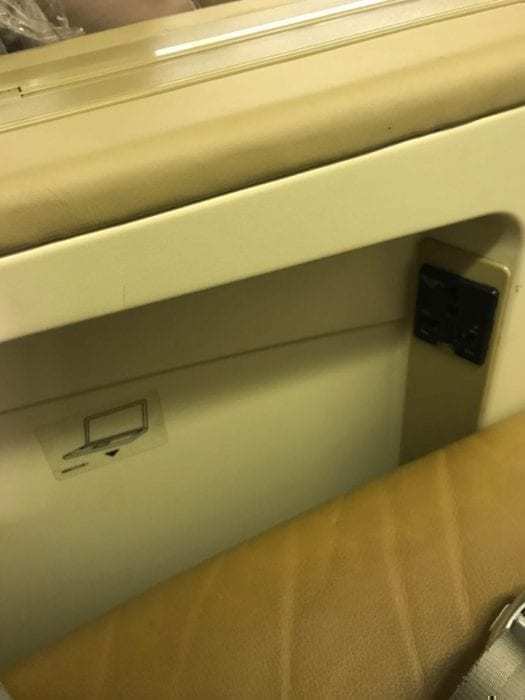 In the left armrest was a place for laptop storage and a power outlet. The power outlet wasn’t active until after takeoff. 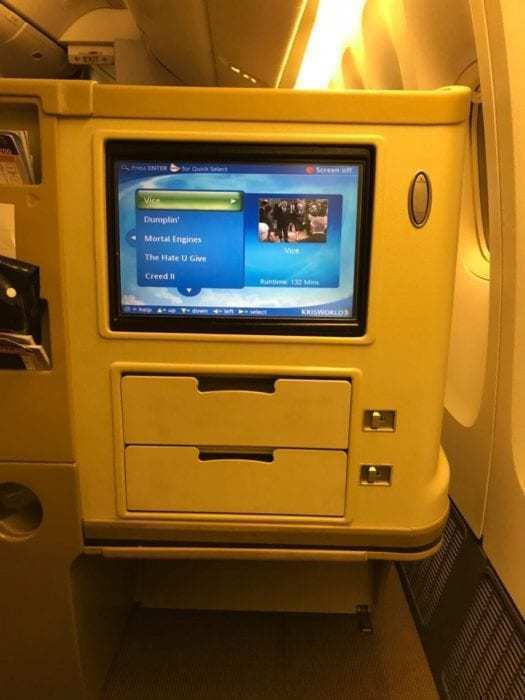 There was a literature pocket and additional storage underneath and around the outdated IFE monitor. The legroom was on the smaller side for an angle-flat seat. IFE, additional storage, and literature pockets. Despite a fair number of years in service, the seat was still sufficiently padded. Singapore Airlines definitely took care in choosing this product when they first introduced it. By modern standards, however, this was no longer a great product for a long-haul flight. In “bed mode” the seat had a very strong incline. 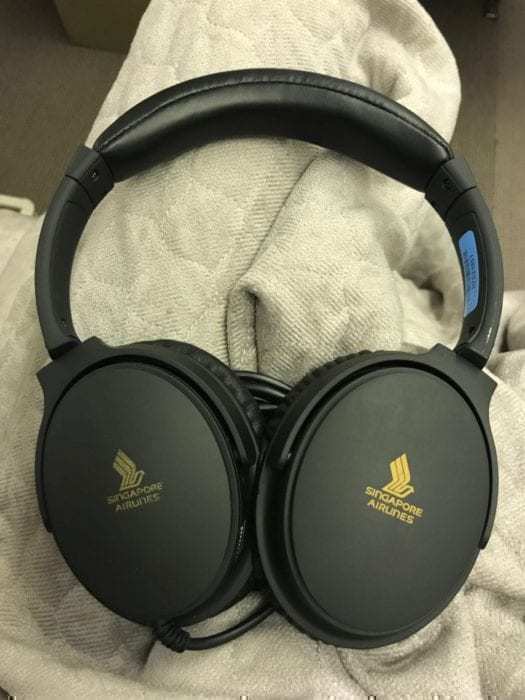 Singapore Airlines offered pretty decent headphones. They were far better than the LSTN headphones Delta offers in business class. 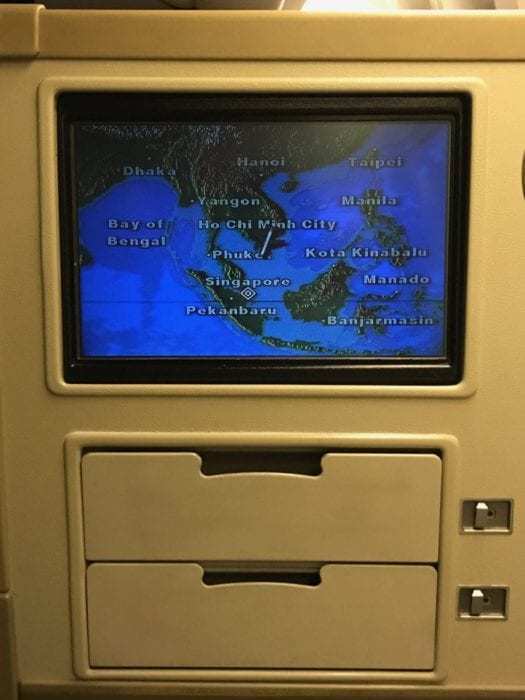 Singapore Airlines is known for good inflight entertainment. However, I didn’t find that on this flight. There was a very limited movie selection and the quality was abysmal. I tried watching ‘The Favourite’, but I couldn’t pick up the dialogue and the screen was difficult to see. I switched over to the airshow. It cycled between different angles of view and some flight information. I couldn’t pick up any wifi on my phone for this flight. 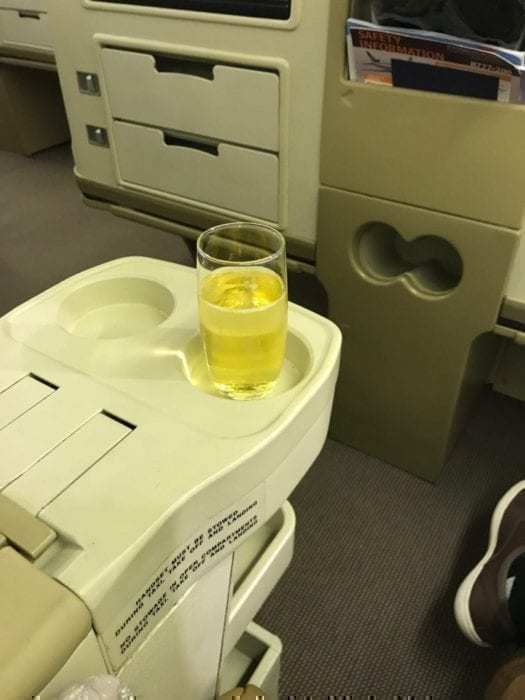 Cabin crew offered a pre-departure beverage selection of juice or champagne. I went with a glass of champagne. I’m not sure what the champagne was, but it was downright disgusting. It tasted more like a combination of grape cough medicine and sparkling water. Interestingly, the champagne served in the air tasted better. I didn’t get a chance to ask what they had served on the ground. The flight attendants were very busy before departure. 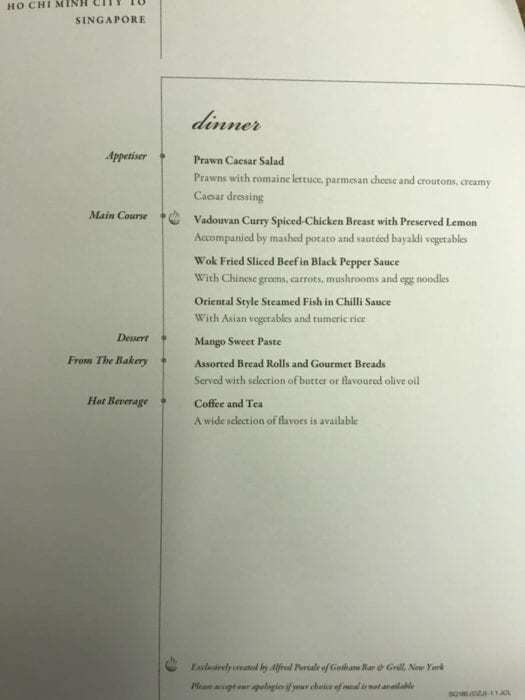 A small menu card was present in the literature pocket. I had pre-ordered the beef option, however, the crew didn’t seem to get that information. Fortunately, my option was available on this flight. The entire meal came on one tray due to the short duration of the flight. I was served the meal less than an hour after takeoff. I generally have lower expectations of catering out of non-hubs. The salad and dessert were fantastic. Normally, I find airplane salads to lack freshness and to be incredibly cold. This wasn’t the case for this salad. In addition, the greens seemed freshly cut. I absolutely loved the dessert. It was not too sweet and had some substance. However, I found the beef overcooked. It was tough to cut and eat. The pieces were large and very dry. The sauce helped to combat this. Overall, the meal was pretty good for a two-hour hop. 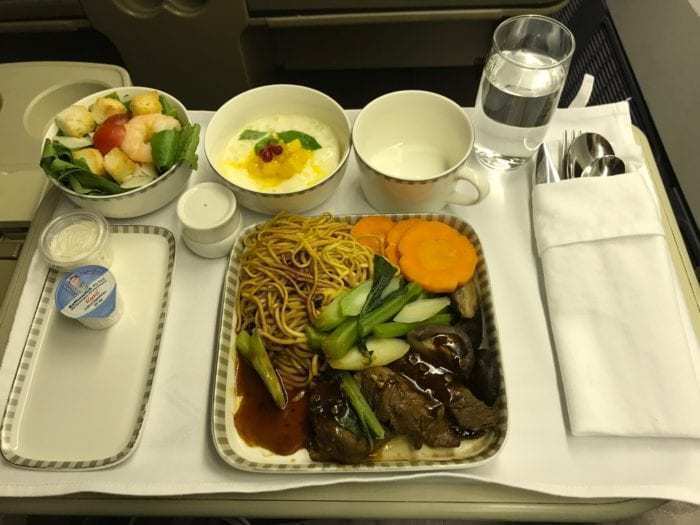 Compared to domestic US routes and intra-European business class, this meal would top them all. It also helped that there were no hard foreign objects in my meal. 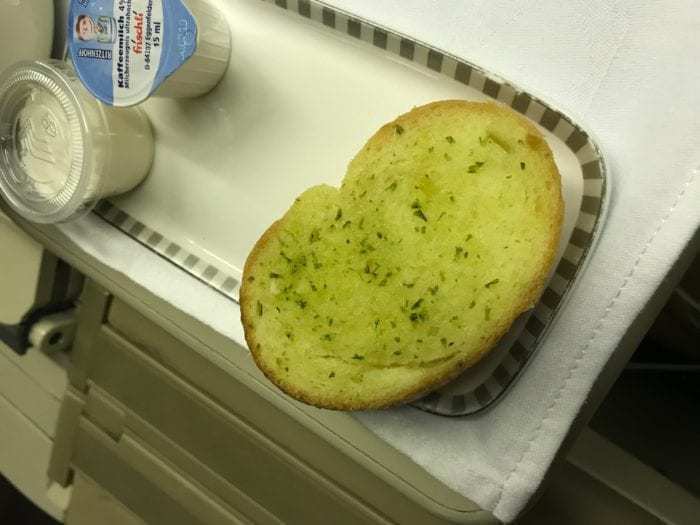 The garlic bread was by far the best garlic bread I have ever had on a plane. It was perfectly done and reminded me of some of the home-cooked garlic bread I’ve had growing up in the Midwest. Meal trays were cleared as each passenger finished. After which, I requested water. 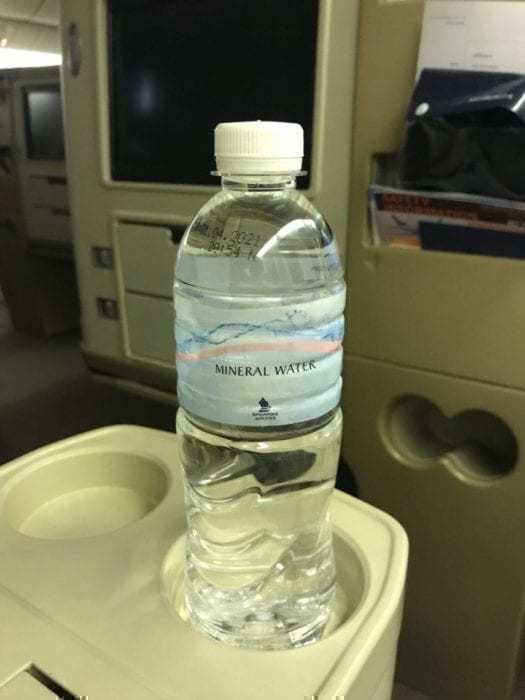 I like it when airlines serve water bottles since it can be capped and, unlike cups, won’t slosh around during turbulence. Singapore Airlines is known for their excellent cabin crew. To me, this crew felt like a really good US crew. Compared to the Vietnam Airlines crew I had from Sydney, they weren’t very proactive. In addition, flight attendants never responded to my call button. I had to go up to the galley to get a bottle of water. When I interacted with the crew, they were enthusiastic and seemed happy to have me onboard. On the other hand, the crew seemed somewhat overwhelmed on this flight, and I don’t blame them for the small missteps. Flight attendants had to plate meals, serve them, clear them, distribute landing cards, and prepare the galleys for arrival in a span of about 1.5 hours. Interestingly enough, the male flight attendants didn’t seem very ‘polished’. Some of them had disheveled hair and wrinkles in their suit. Meanwhile, the female flight attendants had immaculate presentation; not even one eyelash was out of place! I assume this crew was working a direct turn, but I was a bit surprised by that difference. Singapore Airlines handles baggage very well. All the priority tagged bags were out in minutes and in a very orderly fashion. The last minute aircraft swap was a little disappointing. However, maintenance issues do arise and safety should always be the first priority. Singapore Airlines, overall, has most things figured out when it comes to ‘standard’ products. For regional business class, this seat is fantastic. The bedding is on point and the full meal went well. On the other hand, the crew could definitely have used some help. They seemed short-staffed even though there were at least four attendants working the forward cabin. 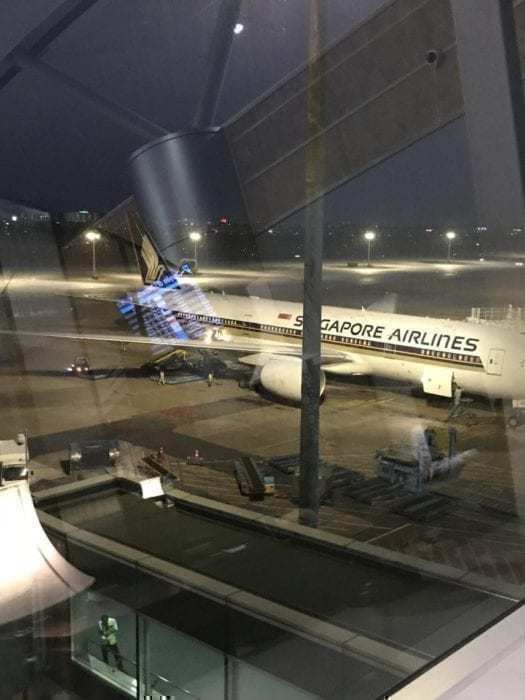 Singapore Airlines is retiring these aircraft. This will be welcome as they are replaced with 787-10 aircraft (with a far superior hard product). I would love to try out a 787-10. But, for a short, two-hour hop, this 777 wasn’t bad. All photos credited to Jay Singh/Simple Flying.